President Donald Trump’s net approval rating was 13 points underwater — the same as last week — in the first survey conducted after the release of a summary of special counsel Robert Mueller’s findings. 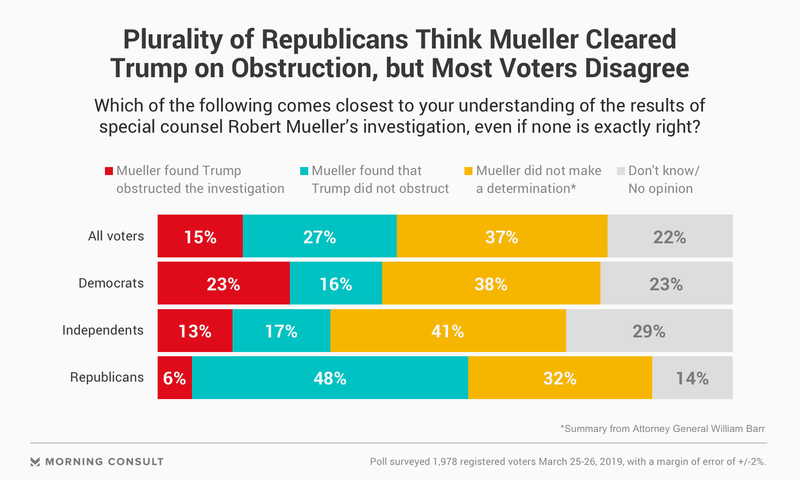 48% of GOP voters said Mueller found Trump did not commit obstruction of justice, while 37% of all voters said he did not make a determination on that question. 82% say the report should be made public; 52% still believe Russia has compromising information on the president. 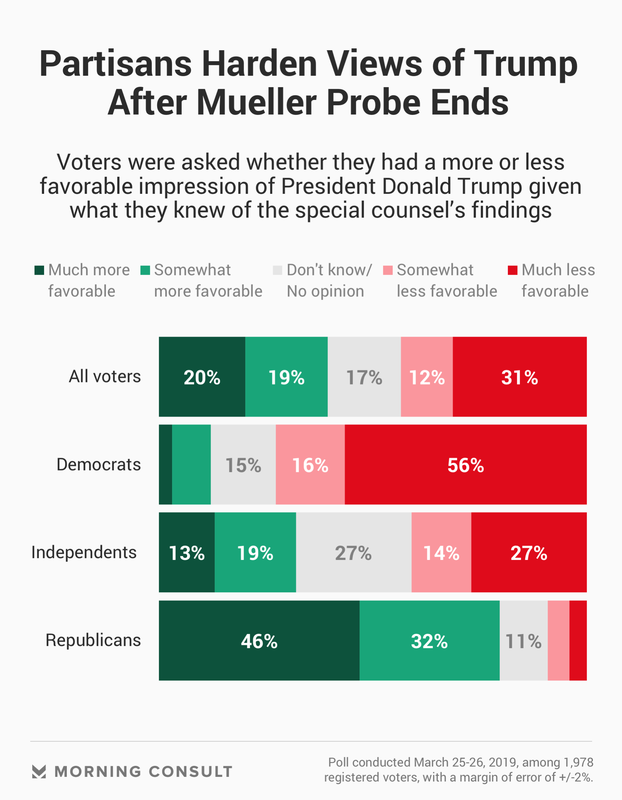 A new Morning Consult/Politico survey conducted after Attorney General William Barr released his summary of Mueller’s findings shows a negligible immediate effect on how the public views the president. The March 25-26 survey found 42 percent of voters approve of the president and 55 percent disapprove – a net approval rating 13 percentage points underwater and virtually identical to the poll conducted the week before. Asked directly, 39 percent of voters said they had a more favorable view of the president after answering previous questions regarding the Mueller report, compared with 43 percent who said they had a less favorable view. Democrats and Republicans mirrored each other, while independents were 9 points more likely to express unfavorable views about the president, 41 percent to 32 percent. Overall, 55 percent of voters correctly identified Barr’s assessment that Mueller did not find evidence that Trump or his campaign conspired with Russia to influence the results of the 2016 election. But on the question of obstruction, views were comparatively mixed about whether Mueller made a determination – a message muddied by the president’s allies and Trump. Half of Republicans (48 percent) said Mueller found that Trump did not obstruct the investigation, while roughly 4 in 10 Democrats and independents correctly stated that Mueller did not make a determination. Regardless of whether voters correctly identified Mueller’s conclusion on whether the president committed obstruction of justice, the determination itself did little to move public opinion: Forty-seven percent of registered voters said they believed Trump tried to impede or obstruct the investigation, compared with 44 percent who said the same in a February poll. Similarly, most voters (52 percent) still believe it is likely that Russia has compromising information on Trump, compared with 51 percent last month. That lack of change was reflected on a range of questions concerning the probe — like those concerning its fairness — that Morning Consult has asked since Mueller’s May 2017 appointment. As the debate over Mueller’s report moves to Capitol Hill, Democratic lawmakers have vowed to press ahead with their own Russia investigation, which 51 percent of the party’s voters call a top priority. But that enthusiasm isn’t shared among the broader electorate, with only 31 percent agreeing it should be a top priority.. Still, the public is fully on board with efforts by lawmakers to make Mueller’s report public, with 82 percent of voters — including 3 in 4 Republicans and 88 percent of Democrats — saying the report should be disclosed. Barr, who was sworn in last month as the Mueller probe was winding down, has said he is reviewing the report for information that could jeopardize national security or other investigations if released. A plurality of voters (48 percent) said they do not think the Trump administration has the right to redact parts of Mueller’s report to protect national security or law enforcement sources, and roughly the same share (46 percent) said they do not trust the administration to release Mueller’s report on Russian collusion without redacting information that is politically damaging to itself. While news of Mueller submitting his report has dominated national headlines, it has not broken through to the masses. Just 35 percent of voters said they had heard “a lot” about the news — much less than the majority who said they’d heard about Trump’s declaration of a national emergency or the college admissions scandal. Instead, the penetration of news of the Mueller report is more on par with stories about former Trump campaign Chairman Paul Manafort’s sentencing (37 percent) earlier this month.